The 1099-DIV is used to report dividends (including capital gain dividends and exempt-interest dividends) and other distributions on stock of $10 or more. Applicable businesses: Banks, investment companies, mutual fund companies and other financial institutions. 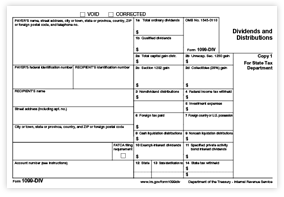 When to file: 1099-DIV forms must be mailed to recipients by January 31, and e-filed with the IRS by March 31 each year.